Moonspell 1755 will be presented twice in Lisbon and a single show in Porto. 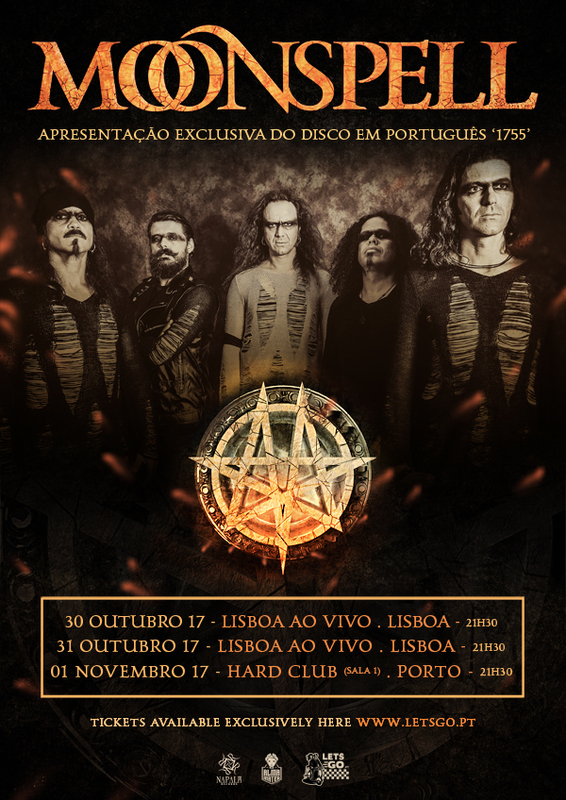 Moonspell and Alma Mater Records are proud to present the first three concerts of the 1755 tour on a dual date in Lisbon (30 and 31 OCT) and a long awaited return to Porto where they have not played for more than two years, on November 1st . These concerts are produced and organized by the band itself, in partnership with their own label Alma Mater Records, with the support of Napalm Records. A return to the origins at various levels, namely with regard to the direct connection with the fans and the total involvement in all phases of construction of a show: from the concept to its realization. Not being a typical case of crowdfunding, it’s the way they consider ideal so that the Moonspell fan can support and buy directly to the band. 1755 is the new Moonspell album, sung in Portuguese, conceptually focusing on the Great Earthquake in Lisbon. A poetic, musical and philosophical reflection of the band on the event of 1 of November of 1755 in Lisbon and its repercussions in the civilized world. The new album will be played in full in Lisbon and Porto, and the alignment for these concerts also includes obscure songs of the Moonspell’s career. Musically, 1755 is a metal root record with vibrant riffs, epic orchestrations and voices and lyrics that testify to the agony of that day. The band was also concerned with recreating the era, with a fusion of percussive and melodic elements that refers to the end of the century and the atmosphere that lived in the Portuguese capital at the time. There will be ten tracks that, in the band’s career, find distant echoes in albums such as “Under the Moonspell” or “Alpha Noir” but that present, above all, Moonspell like you never heard them sing about a Portugal and a Lisbon that is not sunny or touristy , nor luminous. It’s a historical record, rigorous and serious. The black beast that contemporary Music in Portugal is lacking. 1755 has been produced by Tue Madsen (Antfarm Studios, DK) who worked with the band in a few of their previous releases (Under Satanae, Night Eternal, Alpha Noir/Omega White). The first five hundred buyers will have the issues signed by the band.